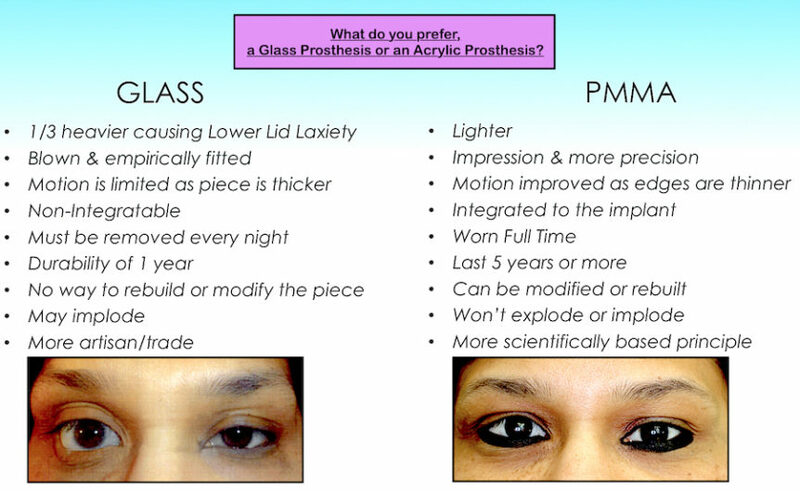 What do you prefer, a Glass Prosthesis or an Acrylic Prosthesis? With the help of scientifically advanced tools and computer graphics, acrylic prosthetic eyes are becoming the most modern and efficient method for prosthetic eye replacement. With acrylic prosthetics, also known as PMMA (or polymethyl methacrylate), there are multiple advantages proven to produce the best outcome for patients. Combined with the ease and comfort of wearing an acrylic eye, they also provide flexibility and durability with care and maintenance; as well as healthy eye socket tissues. Acrylic prosthetic eyes are molded to fit the individuals socket with carefully precisioned impressions. They are light and can be worn full-time with a lasting period of approximately 5 years or more with simple annual cleaning. Built on a scientifically based principle and on a professional level, acrylic prosthetic eyes can be integrated directly to the implant which is under the conjunctival tissue and can be modified or rebuilt throughout time. With thinner edges in the prosthetics, this improves the range of motion due to the proper positioning of the implant to the ocular muscles within the orbital cavity. The material of the acrylic is also extremely difficult to damage or shatter, making it healthy and safe for the individual since the eye socket does not dehydrate the fluids in the eye socket. Tear physiology is vastly improved with an acrylic prosthesis eye vs a glass prosthesis eye. With an acrylic scleral shell prosthesis the tear from the eye divides, so that half of the tear goes over the front of the prosthesis and the other half goes over the back of the prosthesis, and therefore becomes self cleaning with every blink. Originally, ocular prosthesis were produced from glass and although this is a prompt and inexpensive method, they have resulted as a hindrance to prosthetic eyes. As glass prosthetics are physically 1/3rd heavier than acrylic prosthetics, this causes Lower Lid Laxity which loosens the muscles in the lower lid causing them to sag and misalign with the other eye. The glass is blown, empirically fitted and is non-integratable with limited range of motion since the piece is thicker. There is no way to modify or rebuild the piece, and it has a 1 year span of durability. In contrast to an acrylic prosthetic which necessitates simple annual cleansing, the glass prosthetic requires daily polishing due to the tendency of the pores in the glass to decay. Absorbing pores in the glass prosthetic may also dehydrate the eye socket fluid causing irritation. However, the most dangerous aspect of glass prosthetic eyes lies within its ease and possible tendency to shatter as they are fragile and thin. There have been instances where the glass prosthesis has imploded, or has been damaged or shattered from mishandling or polishing accidents. Comparing acrylic prosthetics to glass prosthetics, we can conclude that overall, acrylic prosthetics are much more compatible with the biological role, shape and functions of the eyes. They require minimal maintenance and serve as a significant replicate of the individual’s original eye, providing comfort, relief and assuring self-esteem. As the primary advantage of acrylic prosthetics lies in its durability, it is also a more modern method of ocular implants that provide great range of motion and benefit the health and safety of the patient.